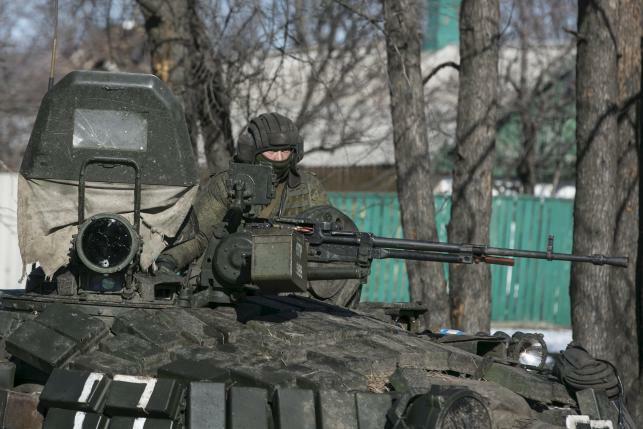 GENEVA, Switzerland -- A separatist conflict in eastern Ukraine is revealing increasing evidence, but not yet conclusive legal proof, of Russian state involvement, senior United Nations human rights officials said on Monday. A Russian fighter with the separatist self-proclaimed Donetsk People's Republic Army sits atop a tank at a checkpoint along a road from the town of Vuhlehirsk to Debaltseve in Ukraine, in this photo taken February 18, 2015. "We are speaking about increasing inflow of (unofficial) fighters and increasing evidence that there are also some (Russian) servicemen involved in fighting," Assistant Secretary-General for Human Rights Ivan Simonovic told a news conference in Geneva. On May 21, U.N. officials interviewed two Russians captured in eastern Ukraine. The two men believe they should be treated as captured servicemen, but Russia says they are former soldiers who had left the military. The pair were charged with terrorism by Ukrainian authorities, putting them "between a rock and a hard place", Simonovic said. "It is very difficult to prove whether they are servicemen or not. That is why mostly we are speaking about 'fighters' of the Russian federation," said Armen Harutyunyan, head of the U.N. Human Rights Monitoring Mission in Ukraine. If Moscow is proven to be a party to the war, it would drag Russia into allegations of war crimes and potentially trials at the International Criminal Court, which Ukraine's foreign minister has said Kiev wants to join. Last July it declared the war to be a civil war, a "non-international armed conflict". The ICRC has not announced any new designation and a spokeswoman declined to say if its advice had changed in private. "We are following developments on the ground very closely and will continue to do so, but at this time we prefer to keep this subject as a matter for our direct dialogue on IHL (international humanitarian law) with the parties involved in the conflict," ICRC spokeswoman Jennifer Tobias said. Despite the two warring sides' claims to be representing the interests of people on the ground, Harutyunyan said there was no popular support for the fighting, which has killed at least 6,417 people, including 626 women and girls, and wounded 15,962 since mid-April 2014. "Among our staff members who are working there in the field, they haven't yet met the situation where people are supporting the conflict," said Harutyunyan.